In judo a judoka uses the strength of its opponent to overpower him. Judo was developed by Jigoro Kano (1860-1938) from the traditional Japanese martial art Jiu-Jitsu. For the pedagogue Kano judo was not just another sport. He considered it mainly an educational method. By judo one learns to handle aggression. Moreover judo is civilized. Without injuring your opponent, you learn to overpower him. 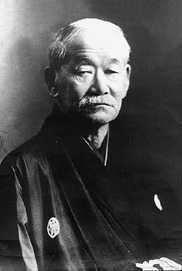 One of the most important statements of Jigoro Kano is: "you can only learn judo by doing it!" "efficient use of energy, both mentally and physically"
Kano named it JUDO, assuming that it not only involved Jutsu (= art, practice), but especially Do (Chinese Tao =way/principle').